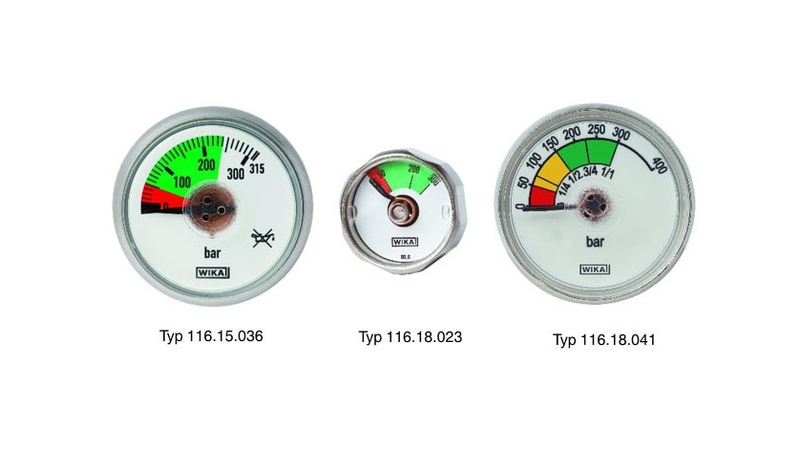 DirectDrive pressure gauges differ in structure and function from standard pressure gauges. Thus they feature special characteristics that qualify them for specific application areas. In DirectDrive pressure gauges, special pressure elements are fitted, which have either a spiral tube (as with the model 116.15) or a helical tube (as for the models 116.18.023, 116.18.036, 116.18.041). The main distinction, with respect to the construction, is that in DirectDrive pressure gauges no movement is needed to transmit the tube travel. In a standard pressure gauge, a movement conveys the displacement of the pressure element. The pointer can be adapted accurately to the intended indication angle on the dial (standard angle to EN837-1: 270°) by means of adjustment. In DirectDrive pressure gauges this movement does not exist and the pressure element end itself represents the pointer. Therefore, DirectDrive instruments cannot be adjusted. The indication angle is always defined as 1:1 by the deflection of the pressure element end. However, to achieve the desired indication accuracy (standard is class 4.0), for each pressure element – depending on the pointer deflection – the dial is selected with the appropriate indication angle. Even the smallest manufacturing tolerances in tubes of the same pressure range can lead to the angle varying for two identical pressure gauge versions. The tolerance within which the indication angle moves for a single instrument version is therefore defined with ± 15°. By default, the indication angle is 120° ± 15. 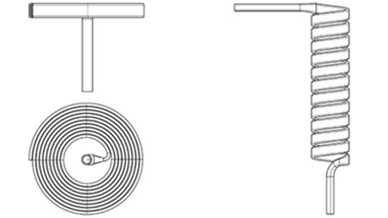 The main advantage of a direct transmission of the tube travel lies in the higher shock and vibration resistance of the instrument. Firstly, there is no movement, consisting of multiple, delicate individual components, fitted and secondly, there is only a single connection point between the DirectDrive pressure element and the process connection. In addition, the specific form of the pressure element also contributes to these properties. Because of the properties set out, DirectDrive pressure gauges are especially suited to applications in which shock and vibration resistance is more important than a precise indication accuracy. They are therefore excellent for applications in which frequent shocks and vibrations occur. In addition, due to their flat design, they are ideal for space-critical operating environments. An important area of application is therefore valves and controllers on mobile gas cylinders. Here it is often sufficient to have a pressure indicator which shows that the pressure is below a given filling pressure. This is usually indicated by a red area on the pressure gauge dial. DirectDrive pressure gauges are very well suited for integration into the customer units. The combination of adapter and pressure element can be directly inserted into the valve contour, so that no pressure gauge case is required. The window, in such cases, is usually delivered separately and is fitted by the valve manufacturer. This provides the customer with particular added value in terms of design. DirectDrive pressure gauges are particularly suitable for customers with specific needs in terms of function and design. The long-term customers of our DirectDrive pressure gauges already know the benefits of the early involvement of our specialists, in the ideal case already during the design phase of the application. Should you need any advice for an existing application or a new idea that is yet to be developed, your person will be happy to help you.